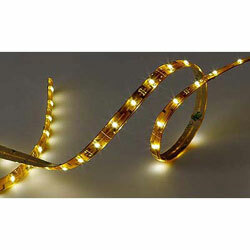 Input Voltage: 24 Volt DC, Power Consumption: 1.25 Watts / ft.
Mount: Surface / 3M Double-Sided Tape (Installed), LED Spacing: 0.66"
24 Volt DC Flexible LED Strip Tape may be cut to suit every 4"
Applications include cove lighting, under-cabinet lighting, cabinets, etc. Power Consumption: 1.25 Watts / ft.
For further details see Data Sheet and Installation Instructions for this product. Note: This product performs optimally with constant voltage at or near the specified input voltage. It is sensitive to over-voltage and transient spikes  long term performance is dependent on input voltage provided. For installation on boats, a Power Conditioner is recommended for maximum life of the product.